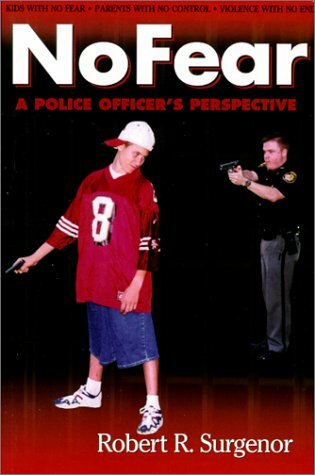 In Detective Robert Surgenor's 1999 book, "No Fear: A Police Officer's Perspective," the author argues that we are in the midst of a juvenile crime epidemic. His central thesis is that the cause of this alleged rise in juvenile crime can be traced to an unprecedented number of parents raising children with a complete absence of corporal punishment. Unable to find a publisher for his manuscript, Surgenor took out a second mortgage on his home and funded the publication of this book entirely out of pocket. With this self-published vanity volume providing him with "published author" credentials, Surgenor has subsequently appeared on MS-NBC, the Dr. Laura television show, and the Montel Williams Show (twice) as well as on local television in the Ohio area. He also speaks on the subject of child discipline and juvenile crime to various Cleveland-area civic organizations such as PTAs, Rotary Clubs, Kiwanis International, etc. Always, whenever he has a public platform, Surgenor repeats the same themes one finds in his book: that he is a published author and researcher, that juvenile crime is soaring, and that his research traces this alleged increase in juvenile crime to an absence of corporal punishment in the home. Lack of spanking in early childhood, according to Surgenor, leads to a lack of fear, which leads to criminal behavior in the teen years. The importance of instilling fear in one's children, and the inadequacy of all other forms of discipline besides spanking to instill the necessary levels of fear, is a point to which Surgenor returns again and again throughout his book. Surgenor recommends use of implements. He also endorses face slapping as well as "boxing" a child's ears, (a dangerous and discredited practice long known to involve risk of permanent hearing damage for the child). Surgenor warns his readers that a generation of violent, uncontrollable unspanked children were foretold in the Bible, and that people working to promote nonviolent alternatives to spanking children are tools of the Devil. Aside from his Biblical arguments and unverifiable anecdotes, which take up most of the book, Surgenor's case rests on three assumptions: that juvenile crime is increasing, that large numbers of parents are raising children without spanking, and that these unspanked children are responsible for nearly all of the alleged rise in juvenile crime. In the following pages, we shall discover that all three of these assumptions are highly dubious at best, and at worst, demonstrably false. On Page Two, we shall examine the U.S. crime statistics of recent years, to determine if Surgenor's claims of a nationwide juvenile epidemic have any verifiable basis in fact.